The School of Public Health and Health Sciences and the Western Massachusetts Health Equity Network held its 3rd Western Massachusetts Health Equity Summit on September 14, 2018 on the UMass Amherst campus. The Summit brought together practitioners, students, planners and community leaders from across sectors and the four counties of Western Massachusetts. Participants worked, learned, and took important steps toward creating greater health equity in Western MA. Workshops and roundtables covered topics on policy, power, the toxicity of racism, and data and analysis challenges. Elizabeth O’Gilvie from the Springfield Food Policy Council & Gardening the Community served as MC. A plenary session titled What do we do Next? New Ideas to Move Health Equity Forward featured speakers Pablo Ruiz from RaiseUp Massachusetts, Gwendolyn VanSant from Multicultural BRIDGE, and Danielle Winters from Arise for Social Justice. For more information, please contact Risa Silverman in the UMass Amherst Office for Public Health Practice and Outreach at the School of Public Health and Health Sciences: at (413)-545-2529, email: risa@schoolph.umass.edu. Lunch and breaks include produce purchased by UMass Amherst Catering Services from Gardening the Community, providing us with food that is locally and equitably sourced whenever possible. Thank you to UMass chefs. This breakout will present a racial justice framework, which includes new ways to utilize data available on the toxicity of racism, why it is vital to discuss race and racism explicitly while not exclusively, and the role and responsibility of public health agencies, and all organizations & institutions in creating and dismantling systems of oppression. Participants will understand steps the Department of Public Health’s Bureau of Community Health and Prevention is taking to mitigate the effects of institutional racism including tools and examples being implemented by programs both internally and in the field. This session will highlight some common challenges with gathering and sharing data when operating with a health equity lens. Community-based researchers will briefly discuss their experiences with collecting data on populations with small numbers, community control of data, and using data to guide priorities. Panelists will individually lead small group discussions following the panel. Democracy is NOT a Spectator Sport: You Can Impact Public Policy! Hear how two colleagues took a Facebook conversation lamenting the lack of support for working women and turned it into the MA Pregnant Workers’ Fairness Act. Then, after hearing key elements of that successful effort to impact statewide policy, participants will learn the basics of how to conduct a low/no-budget power analysis (aka power mapping) to strategically focus advocacy efforts. In small groups, participants will then apply the power analysis tool to sketch a plan to advance a health equity issue in their respective communities. This workshop will explore the importance of having our values honored and embedded within our institutional and economic structures. Doing so can inform our sense of self, our access to our power, and the health of our communities. Join an experiential session provoking awareness of the power we hold within ourselves with attention to the interconnections we have with others. The SPHHS organized and co-sponsored the second Western Mass Health Equity Summit on November 18, 2016, in the UMass Amherst Campus Center. 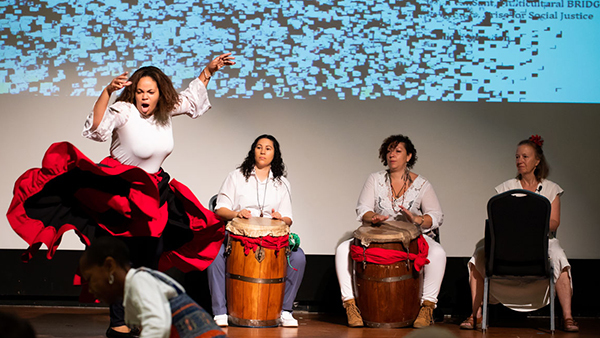 The event brought practitioners and community leaders together to take steps to advance health equity in the region by working, learning, and taking action together. The summit was geared toward a wide range of practitioners, professionals, young adults, and community leaders. Summit organizers were inspired by a vision of health equity in which all residents of the four western Massachusetts counties are able to achieve well-being because unjust and avoidable obstacles are replaced with equitable policies and practices. The summit encouraged attendees to take information back to work in their own communities, as well as join a network to address regional issues to make positive and lasting change. This year's summit included a discussion by the 10-member Coalition of Western Mass Hospitals/Insurers regarding their 2016 Community Health Needs Assessment (CHNA) and the Berkshire County Health Initiative. Organizers also showcased best practices from all four western counties including data and stories on equity and our aging communities, youth mental health, transportation access, food access, and more. Afternoon workshops included a look at policy, power analysis, intro to health equity, health literacy, community-based participatory research, and other relevant topics.